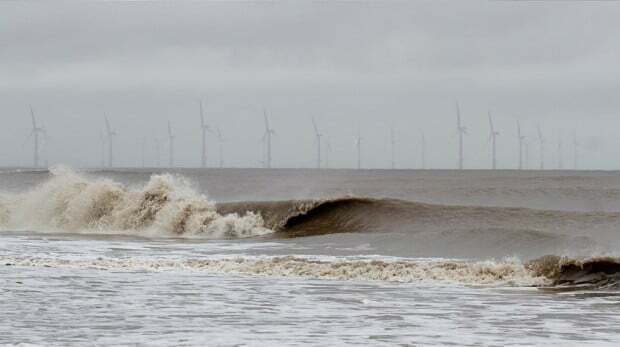 Surfers Against Sewage are inviting members of the Bournemouth surfing and Isle of Wight waveriding community to join them to discuss the potential coastal and surfing impacts of the Navitus Bay offshore wind farm. The meetings will take place with the developers of the proposed offshore wind farm at the Lakeside Park Hotel, in Wootton Bridge, Ryde at 6:40pm on Wednesday 14th August and the next day at Menzies Hotel in East Overcliff Drive, Bournemouth at 6:40pm on Thursday the 15th August. The developers of the wind farm have already undertaken independent studies into the potential impacts of the installation of wind turbines across Bournemouth’s and the Isle of Wight’s popular surfing beaches and wave resources. Through the meeting, SAS hope that the level of any potential impacts is relayed transparently to the local community and that the questions and concerns from the local surfers and recreational water sports enthusiasts are addressed properly. The surfing study is part of the developer’s larger Environmental Impact Assessment (EIA), forming part of its final application for development consent. Following consultation with SAS, Navitus Bay agreed to provide the results of the independent surfing study ahead of the meeting to ensure SAS had a longer time to review the analysis and input in to the mitigation measures that would be developed. Surfers Against Sewage strongly recommends that local surfers attend the meeting to learn more about these results and implications for local waves and beaches. The campaign position of SAS will also be discussed at the meeting. If the Navitus wind park goes ahead, at the nearest point to the shore it would be located 12.2 miles from Bournemouth and 8.6 miles to the west of the Needles on the Isle of Wight. The developers claim it will provide enough renewable energy to power up to 790,000 homes, approximately 9 times the number of households in the Bournemouth area or 13 times the homes in the Isle of Wight area. Members of the public can also talk to the Navitus Bay project team and submit their views on the proposed wind park at the final planned round of public exhibitions taking place in September across eight different locations in Dorset, Hampshire and the Isle of Wight. There could be 136 eight megawatt turbines, or a greater number of smaller turbines. The exact turbine has yet to be decided upon. SAS would not campaign against any perceived visual impact from the turbines but only on the potential for the development to significantly impact on local recreational surfing waves. SAS has recently successfully campaigned against a reduction of up to 22% wave height at Brighton from the proposed Rampion offshore wind farm. Thanks largely to the consultation SAS arranged between the developers and the local surfing community, a revised maximum impact of less than 3% was established giving the surfing community no reason to object. The mitigation suggested by SAS was fewer, larger wind turbines and securing them to the sea floor with low impact anchoring techniques. The result is a win-win for the offshore developers and the surfing community, and of course the environment. This sets a strong precedent for SAS as an organisation. SAS believe that climate change poses a major threat to recreational water users, the marine environment and the global environment as a whole, and strongly advocates action to combat it. SAS supports the advancement of renewable energy sources, including offshore projects, but will examine each new development on a case-by-case basis in order to assess any potential negative impacts on coastal environments, surfing resources and recreation. SAS have also release technical guidance for all offshore developers to ensure they understand how to measure any impacts on the surf and more importantly, how to offset these impacts. It’s important the Bournemouth and the Isle of Wight waveriding community use this opportunity to understand what impacts they might face, how they can best engage and if we feel these impacts are acceptable to help support renewable energies, an important energy source moving towards a more sustainable way of life.